Last week, just a few days before my extended family was due to arrive for a reunion, I started my day in the peaceful company of renowned practitioners from the Ananda in the Himalayas Destination Spa & founder of Asquith, a UK women’s organic activewear brand, who, together, treated an assembled female group to insightful talks about Ayurvedic lifestyle & doshas, yoga, activewear collection preview & delicious lunch, accompanied by beautiful music. Set in the peacefully airy townhouse in Marylebone & a short walk from Oxford street, Asia House remains a hidden jewel, flooded with light & a sense of calm. Picture a grand staircase that makes you feel like a modern Duchess, large windows & doors & the incredibly mesmerising ceilings, the beauty of which I marvelled at during the yoga session. Just being there made me feel like I was being let in on a secret. Ananda in the Himalayas is a destination Spa about which I have heard people talk in inspired tones, but this was my first meeting with the practitioners who work there & unknown to me, I was in for quite a few inspiring lessons. The morning was however started by Alice Asquith, founder Asquith, who I had the pleasure of interviewing a couple of years ago. Since then, her softly fluid, organic yoga clothes that are designed with modern women in mind, with all their perfections & imperfections factored in, became part of my wardrobe, for when I work from home, do a casual school run or workout. 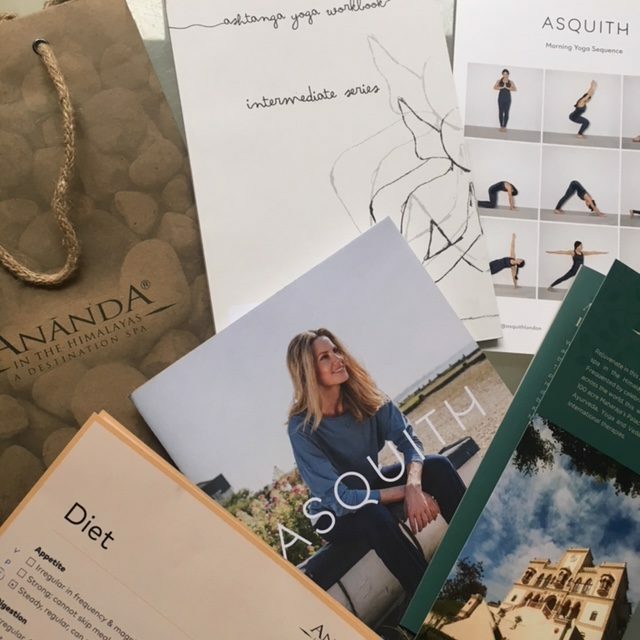 Alice started Asquith 16 years ago, because she struggled to find clothes in which she could do yoga & pilates and which allowed her to look smart enough to walk home after the class. There were plenty of sporty, polyester clothes, but none appealed to her aesthetic. Inspired to create clothes that were comfortable & practical, as well as had a holistic element (it’s one thing for the fabric to draw sweat away from the body, it’s quite another when it feels soft against your skin too), she rolled up her sleeves & remains hands on with everything relating to her brand. If you haven’t heard of Asquith, I recommend that you watch a video that Alice recently posted on Asquith website, about her recent trip to a factory in Turkey, where Asquith collections are manufactured. Use your ‘quiet’ time, armed with a cup of tea, to watch & listen, as it will give you a very good idea why Asquith is different from other activewear brands, yet is very on trend with the recent consumer desire to buy things from ethical brands. After Alice’s brief introduction, we were then treated to a talk by Sandeep Agarwalla, Ananda’s Head of Yoga. Tall, lithe & as calm as a Buddha, Sandeep grew up in the South of India & told us about his journey to yoga ( he had to take a train, bus and then walk to a far away area from his home in order to reach a yogi, with whom he wanted to study). With many years of studying & daily practise, Sandeep showed us the glimpses of what he teaches his clients at Ananda & taught us how to make a Hatha yoga practise & meditation individual to your body’s daily needs. Our chronological age accounts for about 25%, the rest is largely dependent on our lifestyle & choices that we make – physically, emotionally & spiritually. Yoga was created many years ago & for centuries it has been ‘experimented with’, with Himalayan mountains often acting as a natural backdrop. Sandeep considers meditation to be as important, as the sleep & if you visit Ananda, your stay will incorporate diet, yoga & nutrition, created for your individual type of dosha. You will be given lifestyle advice, but the most important part, you will get help & advice on how to make daily choices that will benefit you physically & emotionally. A few hours spent with Ananda’s team allowed me to have glimpses into the work that they do – no gimmicks, no strange marketing terms – just the words that made perfect sense, when their meaning settled into the brain. When it comes to daily yoga practise, doing it in the gym is probably not the best idea, according to Sandeep, as classes are tailored to groups & a certain move might not work for you & your body in a particular moment in time, making it less externalised than it needs to be. In order for you to create a ‘perfect’ practise, make sure you combine physicality, breathing, lifestyle & meditation, even if you only have ten or fifteen minutes a day. Understand each element & integrate them into your lifestyle – traditional forms of yoga allow you to go ‘within’, helping you build awareness of the deep connection between body, mind & breath. Paying attention to life’s complexities & facing your fears in a peaceful environment allows you to re-build a deeper connection with yourself. In time you will notice that you feel lighter & more relaxed, after all, yoga is a spiritual journey, which connects you to the knowledge build up by the ancient yogis practises. Sandeep shared an interesting nugget, which stayed with me: when he reached a yogi with whom he wanted to study and asked him why he chose such a remote area to live in and practise, the yogi replied that if he lived in the city & was too accessible, people would take him for granted. A person who chose to undertake a long journey to reach him proved his own dedication to the journey he was undertaking. At the time when we want instant results, things & immediate access to people, this creates a welcome reflection on how our lifestyle have evolved over the last couple of decades. We did simple (but NOT so simple shoulder rotations, something that teaches you not to make presumptions about your body & it’s abilities in the moment in time), side bends to focus on the often neglected muscle groups, twists (one hand placed on the shoulder, another on the waist), rowing movements – all challenging & making me have almost wondrous Einstein discoveries. So often we get lost in life’s complexities, yet life can & needs to be simplified, making us thrive & blossom. Sandeep then followed it with a restful meditation, which made me almost fall asleep & dream in colours. He taught us not to have expectations of immediate results, instead focussing & observing the rise & fall of the breath. For many of us it’s not easy to stay silent for ten minutes, in part because we lack self connection due to the ever increasing speed of the world & expectations we place on ourselves & others place them on us too. In order to thrive, we all need to be deeply connected & rooted. With yoga session over & feeling totally chilled, I walked to another room, nearly tripping on someone’s mobile charger. Luckily mobile or I weren’t harmed! I examined the latest collection from Asquith – each item in the organic activewear collection (tops, pants, bras) is made from eco-friendly bamboo, organic cotton & bamboo fabrics, letting your skin be caressed by softness, draped in places you want to omit the focus from & enhance those that you are happier with. Long, short & sleeveless tops that don’t ride up when you exercise or move. Comfortable bras that don’t move when you do in a challenging yoga pose or pilates move, enhancing your femininity. Pants that can be worn casually or smartened up with a blouse & jacket. Flattering shades of navy, grey, pink, pebble & coral. We enjoyed delicious chia & porridge pots from Pollen + Grace, as well as a variety of salads for lunch. Pukka Teas. Unhurried conversations. Delicious squares of chocolate from Seed and Bean. Lulled worries, content senses, easy smiles. We then returned to the room where we did yoga, but this time yoga mats were replaced with tables & chairs & we had questionnaires given to each one of us, asking questions about diet, physical & mental activity. As we filled them in, Ananda’s Senior Ayurvedic Physician Dr. Naresh Perumbuduri started his talk about Ayurveda. Hailing from a traditional Ayurvedic family, he is the fourth generation practitioner of this traditional & holistic science. Just by looking at your complexion, eyes, taking your pulse & asking a few questions, he can diagnose your ailments, intolerances & things that negatively impact your wellbeing. ‘When the five eternal substances – Earth, Water, Fire, Air & Space – combine to form the human body, they do so by creating three vital energies, or doshas. These are the vital forces that govern all psycho-physiological functions in the body & mind respectively. When these vital forces are disrupted, we become unwell, so keeping these forces in-check is the optimal key to being well & healthy’. In order to be healthy (apart from your genetics & existing medical conditions), we need to live in harmony with ourselves, which is not so easy in the present state of the world. Most of us can’t ‘escape’ to the Himalayas or any other peaceful place for a prolonged period of time, so what can we do to be well & remain well throughout our individual lifespan? Plenty as it happens, once you know your doshas (we tend to have a ‘permanent’ one, that doesn’t change throughout our life & one that can change due to our lifestyle choices, hormones, age etc). It’s hard to disagree with Dr. Naresh’s statement that ‘we are what we eat, drink, hear, do & see’. Dr Naresh also provided us with simple guidelines on how to adapt & improve our individual lifestyles according to our dosha, from when to exercise to what we should eat. I emerged back into the world from a cosy cocoon of Asia House, with the reinforced knowledge that coming up with excuses for not changing things that don’t work for us is detrimental not only to the health, but for the mind too. Start with getting to know yourself on the deeper level, do things that make you feel good in yourself, eat things that don’t zap your energy & take advice that impacts your health & wellbeing not from influencers, but from those who are qualified to give it to you, based on their life-long dedication to the science of living & their own daily dedication to practises that they teach to a wider audience. P.s thank you to the wonderfully well-organised team of Indigo8 & their warm welcome on the day. The atmosphere at the event was buzzy, yet peaceful, naturally drawing people & practitioners towards each other, allowing for an open dialogue & multiple opportunities to learn & discover. It was a very knowledgable article ,came to know about traditions of yoga ,diet and ofcourse the new brand Asquith.